SkiFit BootCamp - Starts Tomorrow! Get yourself ski-Fit prior to your holiday to ensure you get the most out of your trip, reduce your risk of injury and be more confident on the slopes. This is a progressive 5-week course, with each session building on what we worked on the previous week. Cost: £45 for the 5 sessions (if you miss a session, you're welcome to make it up at one of our regular Fit In The Park classes). This is a progressive course, with each session building on what we worked on the previous week. Cost: £36 for the 4 sessions (NB, if you miss a session, you're welcome to make it up at one of our regular Fit In The Park classes). Strength training for skiing - it's all about squat endurance! If you roll off your sofa straight into your ski boots, with little or no prior fitness training, your thighs are likely to complain and your back, bum and calves may also grumble about being rudely awakened after months of inactivity. So to ensure you get the most out of your time in the snow, and to reduce your chances of injury, do as much ski specific fitness training before you hit the slopes. How long does it take to get ski-fit? You should ideally kick-off your training about 12 weeks before you go. However, it's almost never too late to start, and embarking on a fitness programme, even a few weeks before your trip, will help you to ski better. A little training is always better than no training at all. Just don't expect to transform yourself from couch potato to ski-fit superhero in a couple of days! 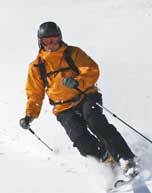 When you're training for a ski trip, endurance should be your focus rather than pure strength. This means doing lots of repetitions using little or no weight. Your aim is to create the toned legs of an endurance athlete, as opposed to the bulging thighs of a bodybuilder. This will enable you to spend more time on the slopes having fun, and less time massaging your tired and achy bits in your room. What's the best exercise to do? Squats are the ultimate ski fitness exercise. They strengthen the legs and bum, and are an easy way to mimic the skiing action and thigh burn at home. They can also help to improve your coordination and balance. But don't just squat up and down on the spot. Create challenging squat combinations incorporating kicks, low pulses, 1-legged squats, calf raises, hops and jumps (ask an HA fitness trainer for a demo if you've not done any of these before or are a bit rusty). Try doing 100 reps using as many different variations you can think of. Then rest for 30 seconds and repeat. If counting reps doesn't work for you, try timing yourself. Keep the squats going, without taking a break, for the time it would take you to get from the top to the bottom of a run. Get fully prepared for your ski trip by also including core strength exercises, balance, agility, cardio and upper body training into your fitness regime. The more work you put in prior to your trip, the more you'll be rewarded with exhilarating skiing, tireless energy and fun! Leg strength and endurance is obviously essential, and a variety of squats, lunges and lifts are used to develop the muscles of lower body. Julia Mancuso, US Alpine racer, takes this to the next level however. She doesn’t just do regular squats; she does tuck squats whilst standing on a gym ball, now that’s talented! Balance and core strength are vital components of the off-piste training programme as they enable the skier to hold good form on the slopes. This is where the plank, side plank and back extension exercises come in. Top skiers also use wobble boards, medicine balls and gyms balls to create additional instability challenges that attempt to mimic what they do on the snow. To take this to the extreme, Lindsey Vonn, US Alpine racer, balances on a tightrope in a tuck position while throwing a medicine ball at different angles against a wall – don’t practice this at home! 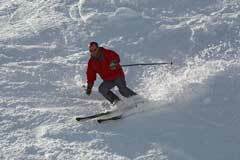 Explosive and controlled power is fundamental, and off the slopes this can be practised by doing a range of dynamic jumping drills. I think the most challenging example of control I’ve seen so far is Ted Ligety, US Alpine racer, jumping from a trampoline and landing on top of a gym ball in the tuck position! Stamina and endurance are also vital, and most top alpine skiers improve their lower body potency by doing leg-punishing hill running or cycling Tour de France style. For something a little more fun, try doing what Bode Miller, another US Alpine racer, reportedly does and push a wheelbarrow full of your friends up a steep hill! Whatever level skier you are, working on your total body fitness prior to your ski trip will improve your overall skiing technique, enjoyment and will help to prevent injuries. Try to avoid boring gym workouts though, and don’t forget that skiing is all about having fearless fun!